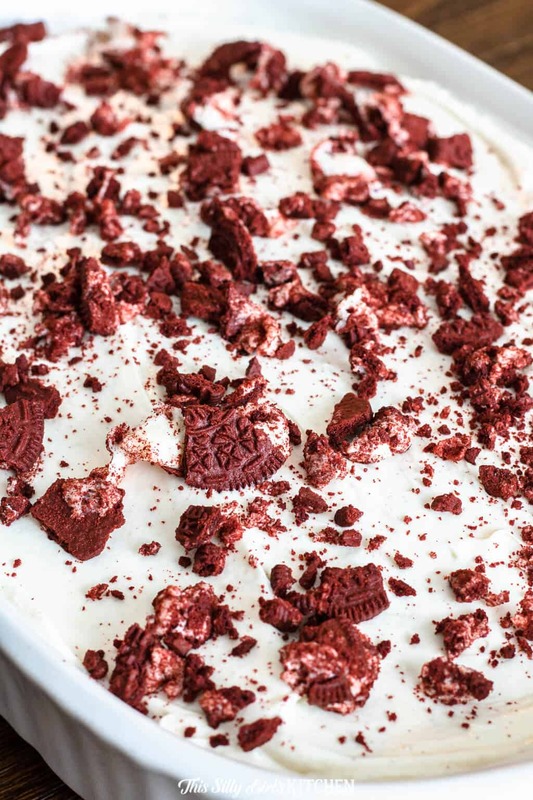 Red Velvet Cheesecake Cake, red velvet cake with a surprise swirl of cheesecake throughout, topped with cream cheese frosting and crushed red velvet Oreos. 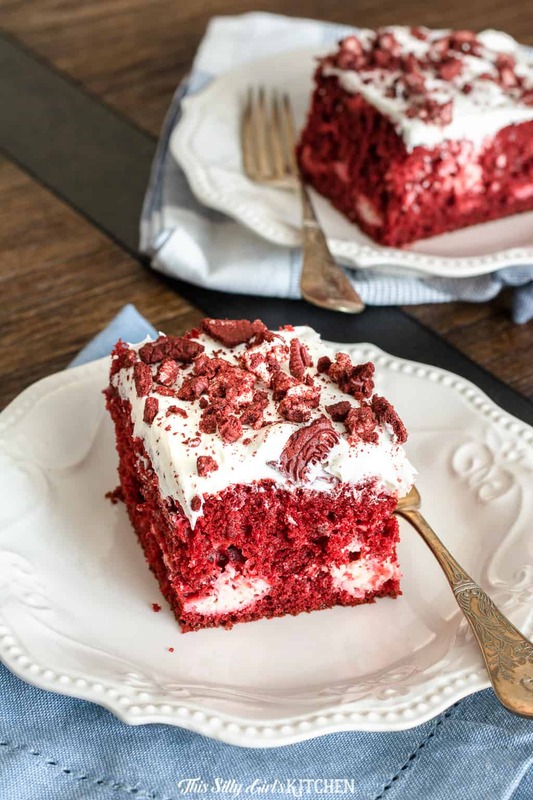 Red velvet cheesecake cake – basically the best cake EVER! I’m telling you, this red velvet cheesecake cake recipe is the best cake I have ever made, seriously. It is THAT good! Okay, I have said this a million times, and every time it is true. Jeremy’s two favorite desserts are cheesecake and red velvet cake (red velvet ANYTHING, really). I love to make food that I know he will enjoy, so I thought why not mash his two loves together into one epic cake. So I did. And, like I thought, it was EPIC. Like I predicted, Jeremy was obsessed with this cake. I mean, what’s not to love? 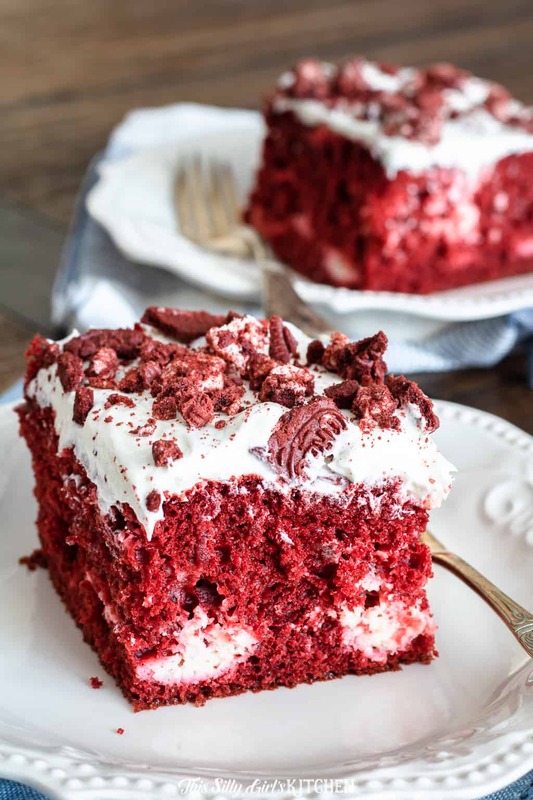 What I love most about this red velvet cheesecake cake is the cake stays super moist even after being refrigerated because of that cheesecake swirl. I can totally see this as a fun Christmas dessert too. You could even go nuts and add a little green food coloring to the cream cheese frosting, how cute! Technically, I cheated and use a box cake for this recipe, woops. 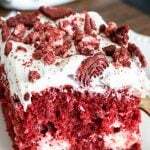 Feel free to use whatever red velvet cake recipe you prefer that will make a 9×13 inch cake. Mix the cake mix per box directions. 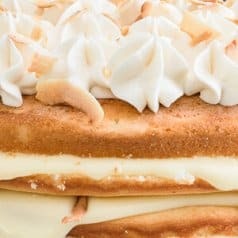 Make the cheesecake filling by creaming together the cream cheese, egg, vanilla, and flour until smooth. Pour half of the cake batter into a greased 9×13 inch baking dish. Using a spoon, dollop half of the cheesecake batter onto the cake batter. Pour the remaining cake batter on top, then dollop the rest of the cheesecake on top of that. Using a knife or skewer, make figure 8’s throughout the whole cake to swirl the cheesecake into the cake. Bake at 350° for 30-35 minutes, until a toothpick inserted into the center comes out mostly clean, a few crumbs are okay but wet batter means it needs a little longer. Let cake cool completely, while the cake is cooling make the cream cheese frosting. Top cake with frosting when cooled, garnish with crushed Oreos. 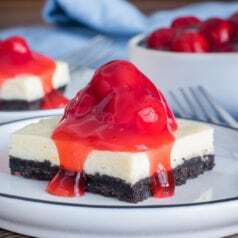 If you are obsessed with cheesecake and red velvet like we are, please visit my other recipes for Pineapple Upside Down Cheesecake, Cookies and Cream Red Velvet Brownies, and Cheesecake Snickerdoodle Bars! Preheat oven to 350°, grease a 9x13 inch baking dish, set aside. 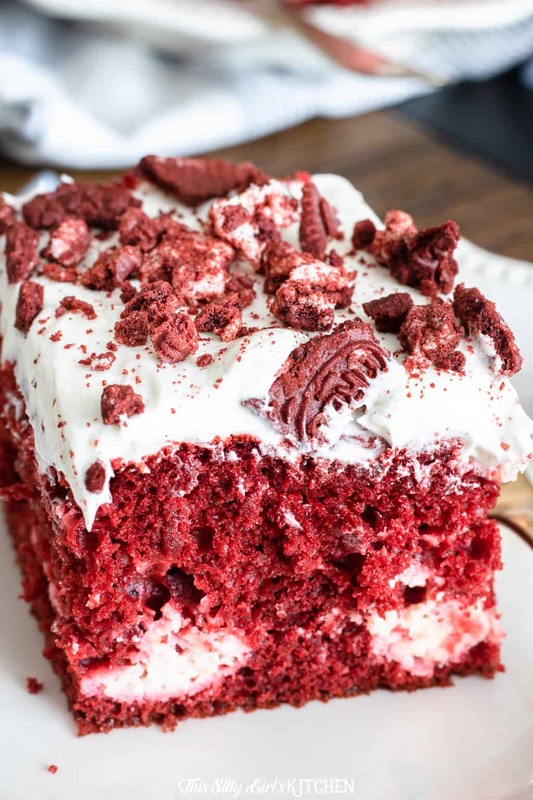 Make the red velvet cake batter first by combining the cake mix, water, oil, and eggs in a large bowl. With an electric hand mixer, mix for 30 seconds until combined. Mix for 2 additional minutes on medium speed, set aside. In a medium-sized bowl, cream the cream cheese with an electric hand mixer until smooth, add the remaining ingredients and mix until combined with no lumps. 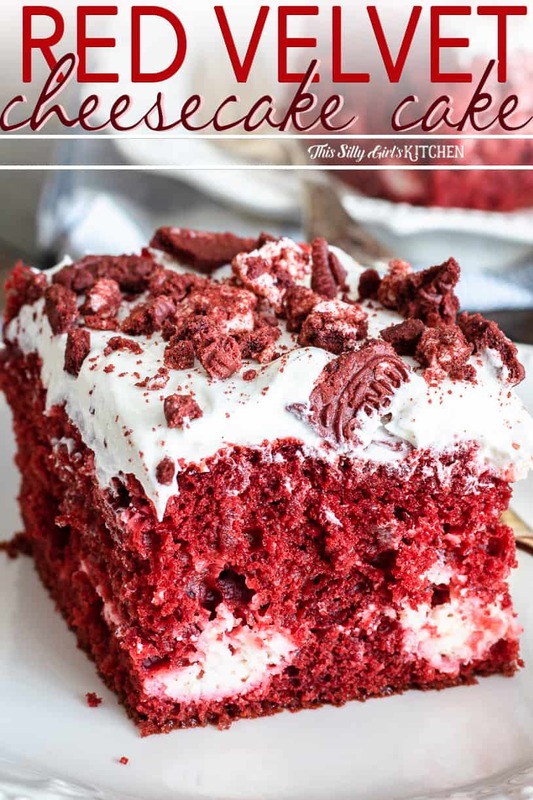 Pour half of the red velvet cake batter into the baking dish and spread evenly with a spatula. Dollop half of the cheesecake batter all over the top. Pour the remaining cake batter on top, and dollop the remaining cheesecake mixture. Using a butter knife, make figure eights throughout the whole cake to swirl the cheesecake mixture into the cake mix. Bake for 30-35 minutes, until a toothpick inserted into the center of the cake, comes out mostly clean with no wet batter. Place on a wired rack to cool completely. Cream together the butter and cream cheese in a medium-sized bowl with an electric hand mixer until smooth. Add the powdered sugar a little at a time until fully incorporated. Add the vanilla and whip until light and fluffy about 2 minutes. Make sure the cake is completely cooled before adding the frosting. Frost the cake, top with crushed Oreos for garnish, optional.